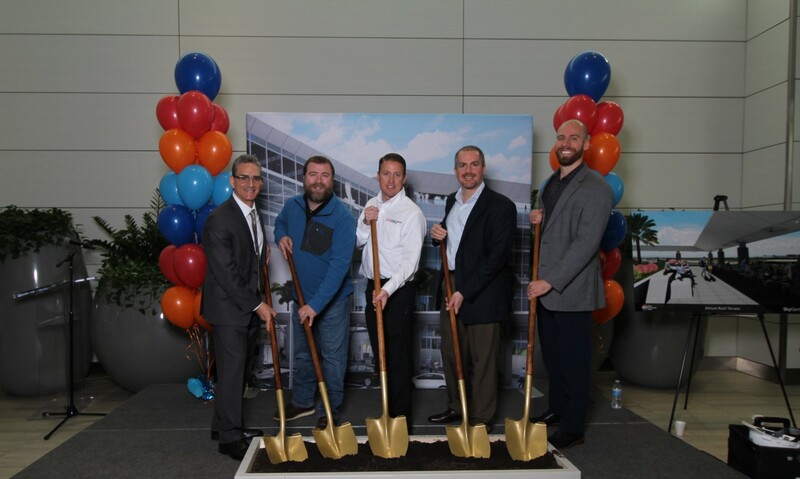 On January 25th, Hensel Phelps, along with Tampa International Airport’s CEO, Joe Lopano and stakeholders Hillsborough County Aviation Authority (HCAA), Gresham Smith, TLC Engineering for Architecture, Stantec, and VoltAir broke ground on the Tampa International Airport greenfield site to make way for the SkyCenter development. The project will consist of a new four-story, 40,000 SF atrium structure. It also features a 17,000 SF planted roof terrace and a 230-foot long elevated pedestrian bridge that connects the new SkyCenter Development area to the SkyConnect People Mover System and Rental Car Center. In addition, the project includes roadways, a remote commercial curb and a reconfigured cell phone lot. Officially awarded by HCAA on December 6, 2018, this is Hensel Phelps’ 3rd project at the Tampa International Airport. Hensel Phelps received the Notice to Proceed on January 14th, and the project is scheduled to be completed on May 28, 2020.